What would it really take for the U.S. to end its energy problems ? 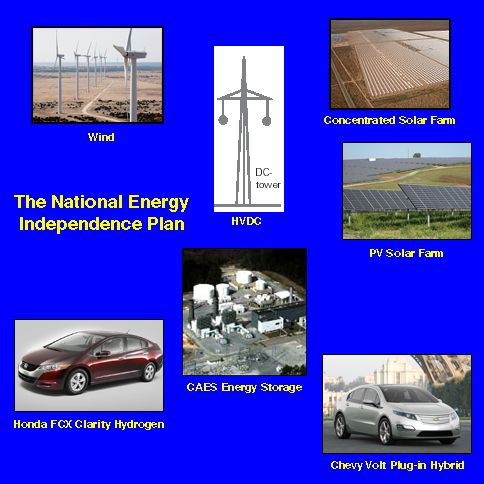 The NEIP demonstrates that wind and solar energy can replace most fossil fuels by mid-century. It does not preclude other sources, including nuclear and some fossil fuels. America cannot solve its energy problems without conversion to an all-electric economy--which allows saving $1 trillion per year. Path A is directed at the first part of the first threat, unaffordable imported oil. To displace 100% of the oil America imports per year, Path A has three parts: the electrification of building conditioning; a liquid fuels program for heavy vehicles; and electrification of light vehicles. Total oil displacement is 28 Q-Btu, equal to total oil imports, in 12-15 years. Path B, concurrent with Path A, Builds the national grid shown at left. Onshore wind from the Mid West is built out first, in order to fuel light vehicles (hybrid or fuel cell) in Path A. CAES energy storage converts intermittent renewable energy to base load electricity 24/7. Vast solar farms follow. Electric rates do not rise above 13.5 cents per kWh. Copyright 2008, 2009 2010 G. Wm. Bailey., Newark Delaware. All rights reserved.